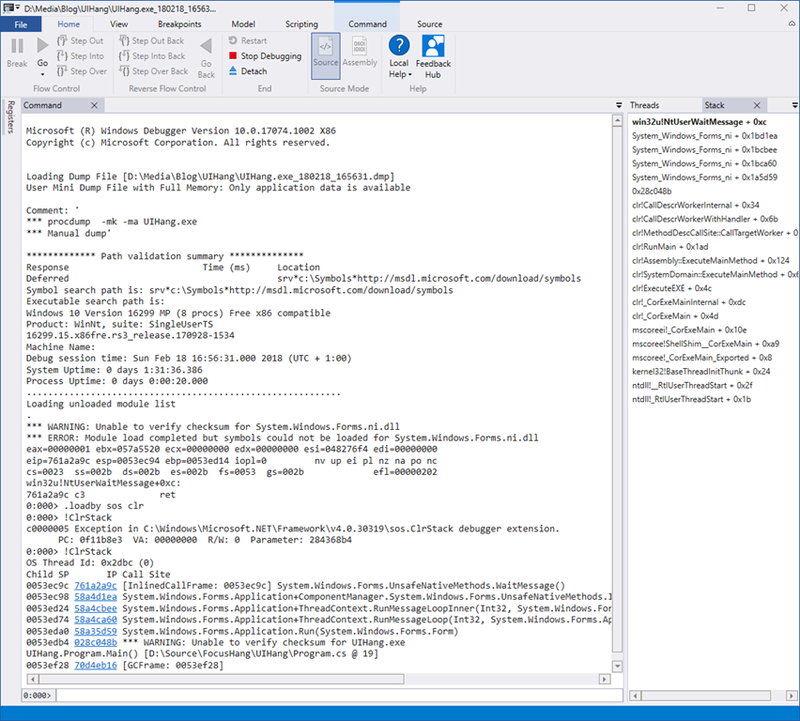 Warning: This post includes ETW, Windbg, Kernel and Process memory dumps. If you don´t want to deep dive into the Windows Internals you should stop reading now. 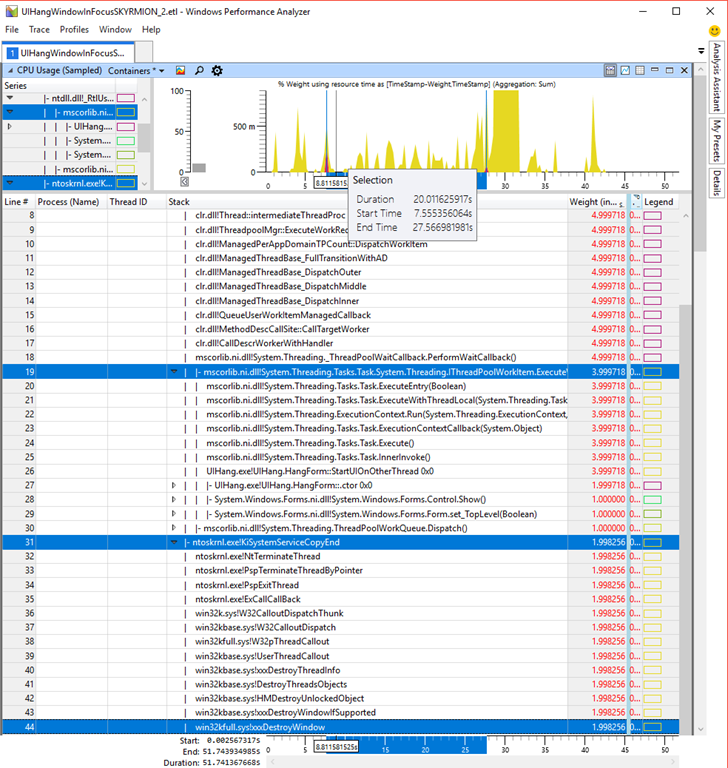 With Windbg we can examine where the UI thread is stuck from a live process or a memory dump. For managed code we need to load sos.dll as usual. which is a perfectly legal call stack and is by no way an indication of a hung UI thread with the id 0x2dbc. The deadlock check command for unmanaged locks !locks yielded no results and the managed counterpart !SyncBlk also showed nothing. The other threads also look normal. By the way how would a not normal stack look like? If something has got stuck I simply check out the stacks with the longest stacktrace because these are usually which are actually doing more than waiting for things to happen. But as you can see from the picture above there are no long stacks involved. [16:56:31] Dump 1 writing: Estimated dump file size is 177 MB. you get a sad face which contains as bug check code MANUALLY INITIATED CRASH which is just what we want. You can use the .reg file also on Windows 7 machines where you get a full memory dump because the FilterPages registry key is ignored on older Windows versions. On my 16 GB machine I now get a small 2,2 GB dump file. If you want to transfer large files you should compress the data as much as possible. 7z archives are in my experience about 20% smaller than regular .zip files at the expense of ca. x5 times longer compression times. You can use multithreaded compression with the LZMA2 switch which splits the data into blocks which can be compressed by multiple threads. If you resort back to LZMA then then the speedup is much less. If you are doing this on a server machine where users start working after you have taken a memory dump you should perhaps stick to the .zip format to compress on a single core and stay nicely in the background. Hm. 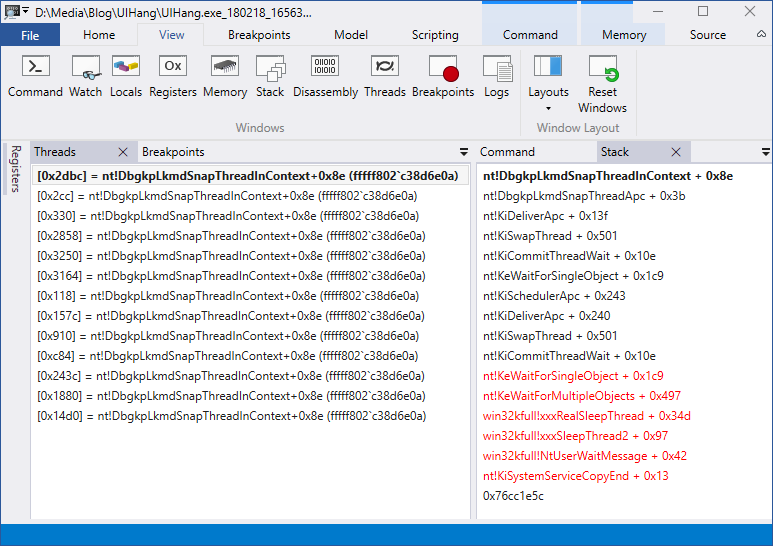 That is a .NET Threadool thread which waits for more work to come. There is no indication what did happen before on that thread. But since we have recorded ETW tracing we know thanks to high frequency sample profiling data with 8KHz a lot of the history of that thread. The default sampling rate of 1kHz is not sufficient when you are searching for cheap method calls which can have far reaching consequences. In this case we are not looking for a performance issue but we want to know which methods this thread has executed before it was waiting for more work. InvalidOperationException: “Cross–thread operation not valid: Control ‘<name>’ accessed from a thread other than the thread it was created on. if you try bad things like that. The window was created on another thread but it did not attach the thread input queue directly. Instead it was calling user32.dll!SetParent which did in the kernel in the win32k subsystem attach the window input queues by calling zzzAttachThreadInput. That is all happening on our non message pumping TPL Task thread which is the missing ingredient to finally understand why our main UI thread was blocked due to a programming error on a seemingly unrelated thread. We have from the zzzAttachThreadInput method even with 8kHz sampling rate only one stack trace where one still needs a bit of luck to see the root cause so nicely with ETW data. But if the window message pump is stuck the results of this ETW provider and the WPA Window In Focus chart can be misleading. Window message queue issues are notoriously hard to debug because most relevant data is only available during live debugging while you still can query window states with e.g. Spy++. But if you only have a memory dump you will have a hard time to figure out what went wrong. 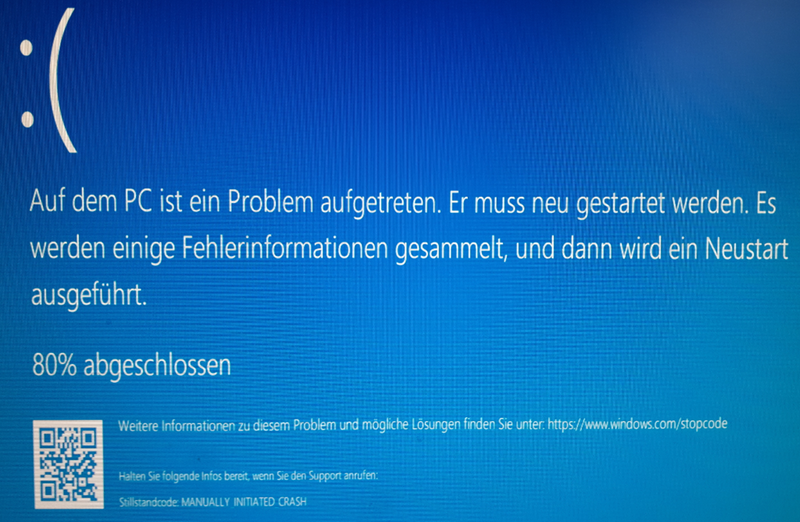 A kernel dump would give you all information but since no public information is present how you can examine the contents a window message queue this must be left as an exercise for Microsoft support. If someone knows how to get e.g. thread affinity from a user mode memory dump from an HWND please leave a note below. Once again memory dumps and ETW tracing have helped to find the actual root cause. The memory dump helps to find stuck threads and strange data points. ETW helps you to find how you did get into that state once you know from the dump file where you need to look further.